Is the Australian Terrier good for you? The Australian Terrier breed serves as great watchdogs due to their amazing sense of sight and sound. An Australian Terrier puppy is very intelligent and easy to train. These perfect household pets are protective of their family, fun-loving, obedient, and good with children. The Australian Terriers are adept vermin hunters, watchdogs, and in some cases shepherds, making them the smallest of all the working terriers. 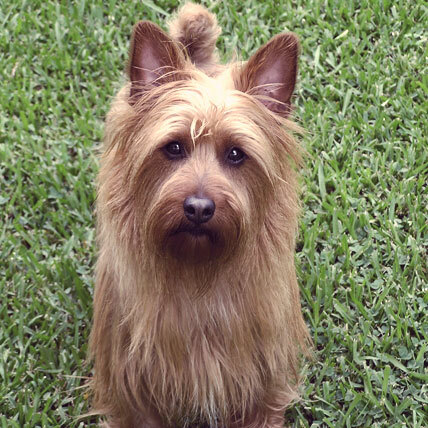 Thought to be a mish-mash of Cairn, Norwich, Dandie Dinmont, Irish, Skye, and Yorkshire Terriers, the Australian Terrier was first recognized by the AKC in 1960, despite having been helping out on farms in Australia for almost a hundred years prior. The Australian Terriers feature an elongated muzzle, pointed ears, stumpy legs, barrel chest, and a docked upright tail. They have rough weather-resistant coat, which varies between solid red, sandy, or dark/silvery blue with tan markings on the head and legs. Normally, this breed of dog may grow up to a height of 9–11 inches and weighs around 9–14 pounds. The Australian Terriers are extremely intelligent and protective of their family. They are a fun-loving and lovable breed of dog. They are excellent as watchdogs, as they have very good sense of sight and sound. They are more obedient than most of the terriers, and are always ready to please their master. They are easily trainable and are good with children, although they tend to be aloof with strangers. The Australian Terrier can be any of the following colors: black, black and white, tan and black, red and black, white, ivory, cream, yellow, and silver. This dog breed is very healthy and does not have many health problems. The Australian Terriers are free of most of the major hereditary diseases.